If someone asked me to sum up the last few weeks in one word, that word would be INSPIRED. 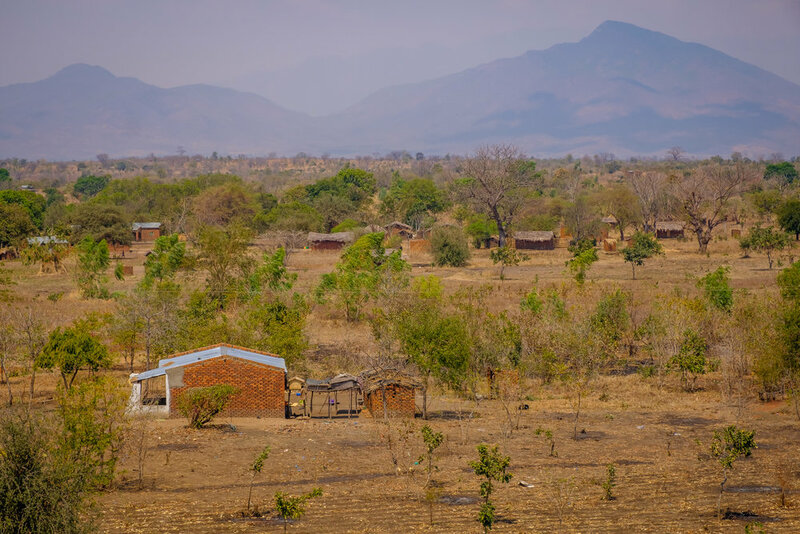 From the outside, inspiration may not be a word often associated with Malawi, as most news highlights the high rates of corruption, HIV, child marriage, environmental devastation, and grinding poverty. However, if you peer just beneath those cliches you find people who are not victims or complacent to the situations they find themselves. No, rather you find those who strive to build a better station for those around them. It is just those kinds of people who I found down a rock strewn, dusty, dirt road, winding its way through dry river beds and rural farms in Balaka, Malawi. In this most humble of sites you will find people dedicated to improving the lives of their children. 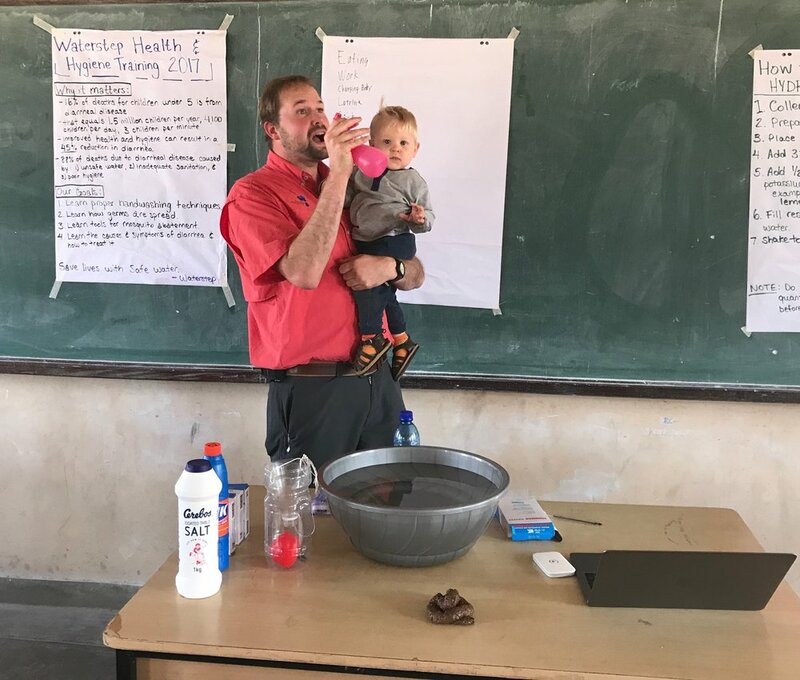 I have had the honor to work with a group of educators and community leaders dedicated to bringing health and hygiene training, improved sanitation, and safe water to the students of the Dziwe Secondary School. A view from atop the tank. The school is surrounded by rural farming communities that sit in the shadow of distant mountains. The school itself serves nearly four hundred of the communities' children; almost half of which are girls who live in the compound's dorms during the school year. Also residing on school grounds are the headmaster, teachers, and their families who live in small cottages. Despite unreliable grid power and limited resources, the teachers and staff have worked hard to improve the quality of life of their students. This is evidenced by the previous construction of well-designed latrines, solar panels for classrooms, and the on-going work on an irrigation canal designed to drain pooling water away from school buildings to prevent the spread of malaria. 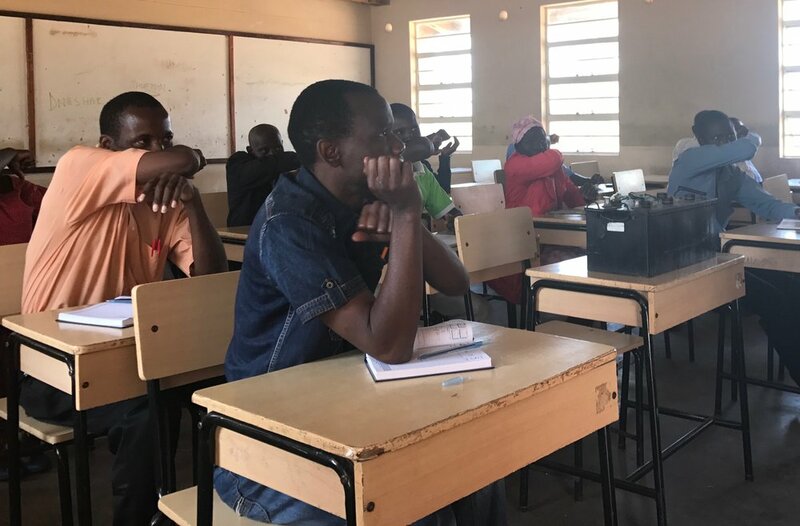 Led by the school's Headmaster, Mr. John Mizeki, around 20 people from both the Dziwe Secondary School and the local Community Based Organization (CBO) met to receive training and equipment provided to me by WaterStep. Headmaster John Mizeki oversees the operation of the Bleach Maker. 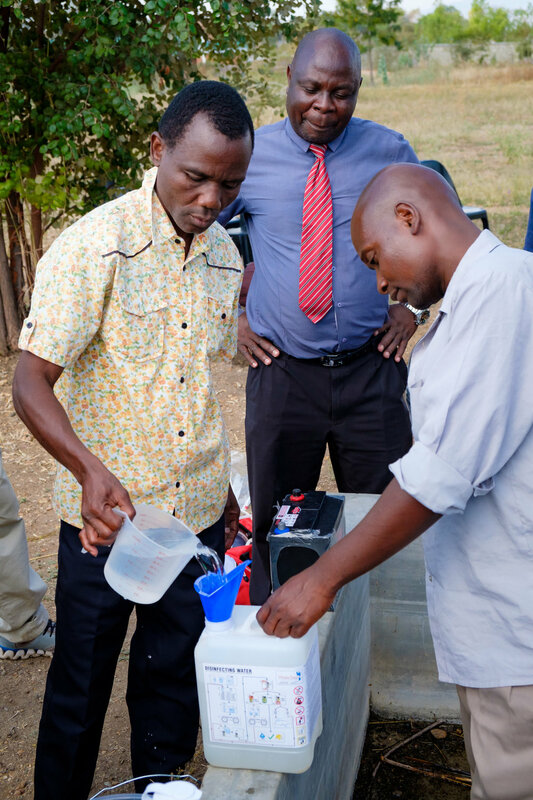 Group Village Head (Chief) Mpilisi worked closely with the group to learn how to operate the WaterStep equipment. For those who don't know, WaterStep is a Louisville, Kentucky based non-profit organization (NPO) that provides safe water to developing nations and disaster areas through training, and equipment. I have been associated with them for a couple years, and even spent some time in Costa Rica with them installing water purification technology and providing health and hygiene training to rural schools. WaterStep's Health and Hygiene training is an interactive lesson set that can be tailored to any audience from school children to adults. Here, I trained adults who will later train both the school's students and other individuals who can benefit. By utilizing a training the trainer method I hope the knowledge provided will reach many more people in the area. 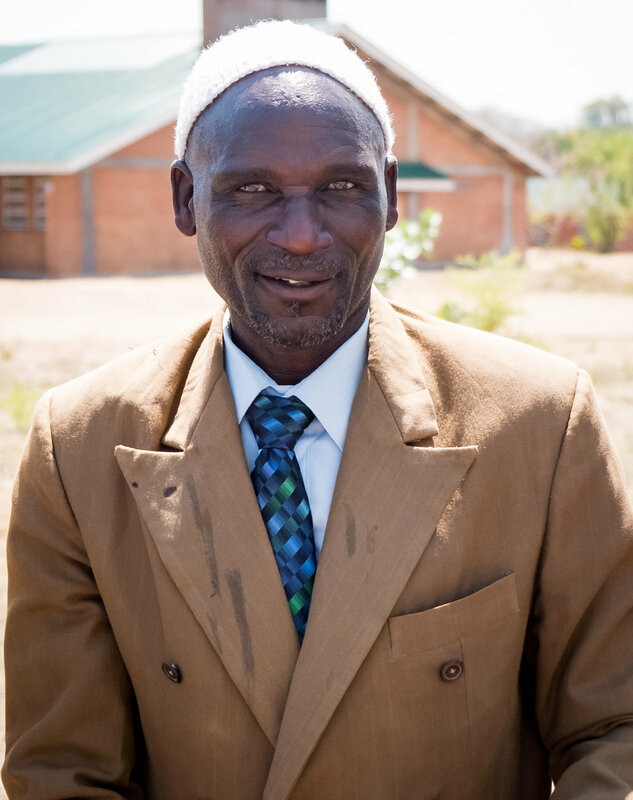 The group in Balaka consisted of people with varied backgrounds such as science teachers, grounds keepers, treasurers, and the area's chief. Benjamin was a great help in teaching the class! How do you cover your mouth when sneezing or coughing...... like Dracula! 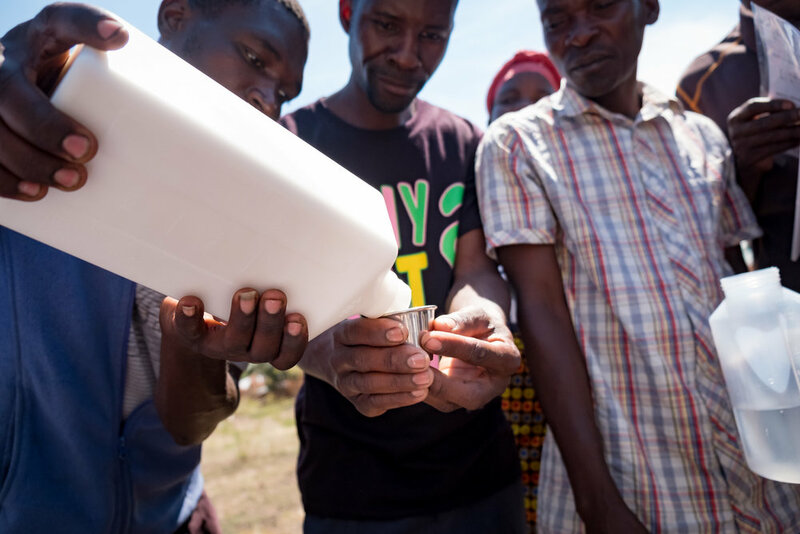 Taught via skits and demonstrations, the class provides simple, cost effective means to reduce disease transmission within the target population. The group first learned about germs, and how they are spread. Following that foundation, I taught how to prevent the spread of disease through washing hands, using surface cleaners, creating fly traps, and other methods. We also discussed how to mitigate health and hygiene problems they are specifically concerned about. Following the classroom session the group performed skits to reinforce the training, a method I borrowed from The NGO Malawi Matters, and we walked around the compound to create a actionable plan to reduce disease. Next the group learned how to install, operate, and maintain the two pieces of equipment provided by WaterStep, the Bleach Maker, and the M100 Chlorinator. The level of chlorine produced by the M100 is determined using a small included test kit. Without help, I made the group teach me how to operate the system. They didn't miss a step! 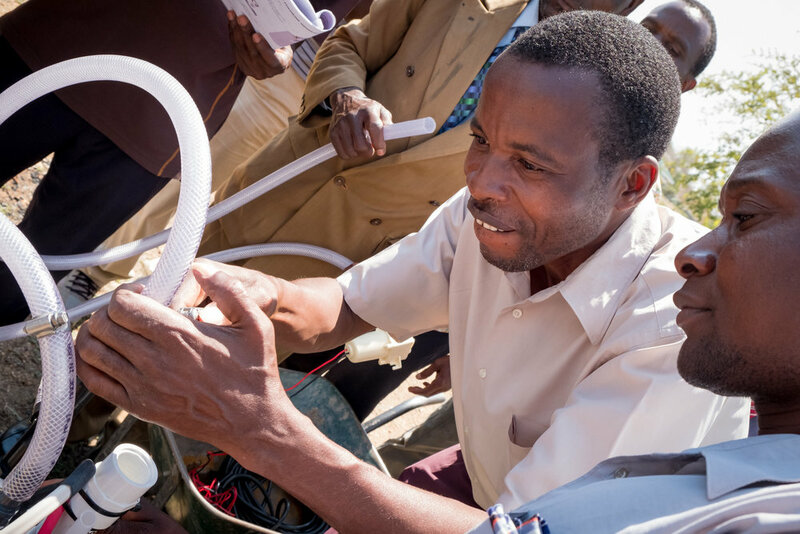 Here you can see the head science teacher leading the group in assembling the chlorinator. The M100 Chlorinator utilizes salt, and a 12 volt battery (car battery) to purify large volumes of water. I'll do a more detailed post about both the systems later. However, the football sized M100 is more than capable of providing safe water to the entire school. It's an incredible technology! That little silver cup is all the salt needed to clean tons of water! One last practice, before carrying the chlorinator to the top of the tank. The Bleach Maker..... makes bleach. That might not sound all that incredible, but using the same salt and car battery from the M100 creates a medical grade bleach in about an hour. This can then be cut with water for general sanitation. Whats more, any excess can be packaged and sold turning the simple machine into an income generator for the school. In fact the headmaster has already found potential buyers. Preparing bleach for sale! Headmaster Mizeki has found other area schools who want to buy their excess bleach. Safety first! Once manufactured the bleach must be stored in marked containers. Before I go forward, it is important to note that to be invested in the project, the school painstakingly, over the course of weeks, raised the money to purchase a battery, battery charger, and containers for the bleach. That's how dedicated they are! Focused on improving the lives of the students! Practice is over. Several teachers and staff chlorinate the school's tank, while others below make bleach. 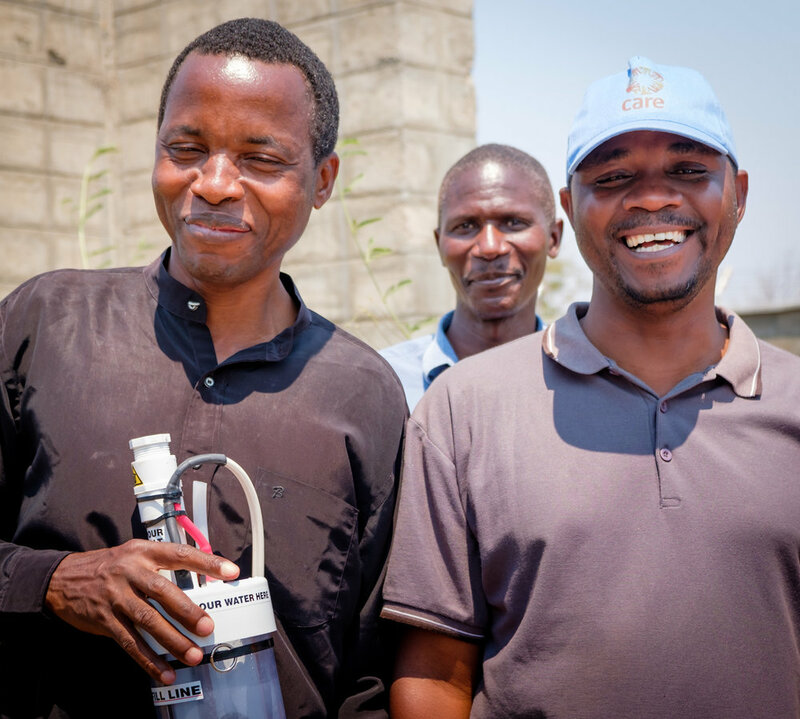 It has been a privilege to work along side such dedicated people from the Headmaster Mizeki to the teachers who will teach health and hygiene to their students, to the staff who will climb a 20 foot tower everyday to chlorinate the tank that provides drinking water to the students. I hope their story leaves you feeling the same as I do.....INSPIRED!! Success! A properly chlorinated tank. This could not have happened if it wasn't for the gentleman on the right. Chimwemwe Limani works for Catholic Relief Services. We've been working together for a year, and he found the school and made all the arrangements. One of the brave shouls getting ready to carry the M100 to the top of the tank. If you enjoyed this article please like and share on Facebook. As always we welcome your comments. In February, I spent roughly two weeks traveling all over Malawi doing pre-dissertation fieldwork with the nonprofit Malawi Matters. This was a very quick trip, but essential for making sure all the parts of my project are moving forward. Read more about that trip here! In May I found a way to engage with a project near and dear to my heart: keeping girls in school! I worked with my mom and a great group of ladies from Hopeful Lutheran Church to sew reusable feminine pads that I will be delivering to women leadership working with Malawi Matters. These pads are the literal difference between school and no school for girls across Malawi. What a difference these pads will make! Thanks ladies!